The other day, I was sitting in my computer/dining room, and I heard a noise coming from the bedroom. 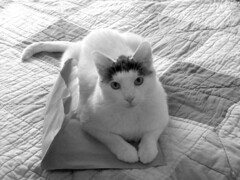 I found Screech on my bed, laying on top of a paper bag. He was so cute I had to take some shots. This is my favorite of them all. His eyes are so expressive. Isn’t he adorable? Next postDarn you to HECK, Comcast!